Location: San Joaquin Valley, CA. I found this pattern a few years ago online, it is super simple and really quick to work up, usually about an hour. 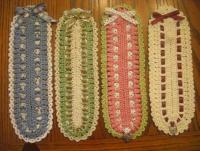 I have made dozens and the fun part is choosing different color combos and using different ribbons. I like to attach a cute charm also. It is fun to make them seasonal too for every holiday. I have given away so many and it's a good item to have on hand for a quick gift. They are so cute- do you have the pattern you can share? Oh I like those alot. Is this a pattern you can share? I am making bookmarks for the library we are opening so the faster to make the better. Yes! I have the patten in my file, I will get it posted tomorrow, it may take me a while to find it. I don't use it anymore as I have memorized it. It's super easy! They are all so pretty!!! I love making bookmarks. Thanks for sharing. They are wonderful looking bookmarks. Is there anyway anyone can post the pattern for these bookmarks. I had it years ago as well and I cannot find it again anywhere. Please? Begging! Can you share the pattern please? Pretty bookmarks.. Love the colors! I love them.... great job! does anyone have the pattern for these bookmarks? I love your bookmarks and how you decorated them. 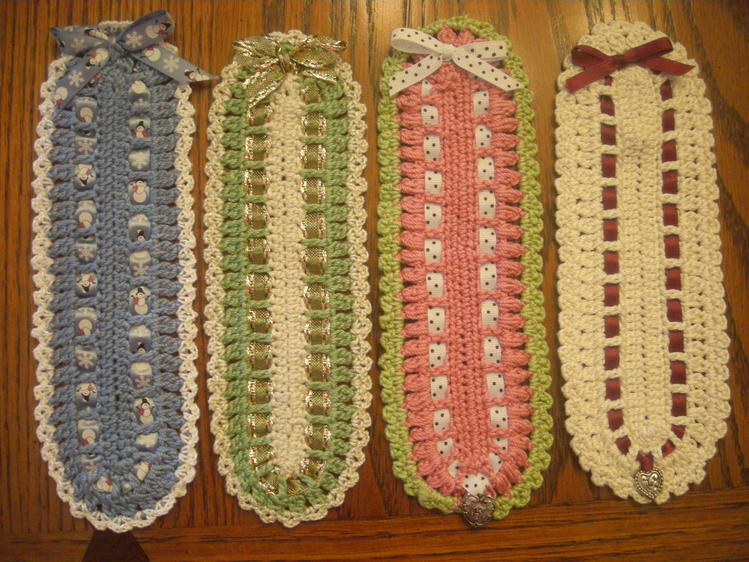 If you scroll down to the bookmark section she has a couple made with thread that you weave a ribbon through. One is called Quickie, it's really pretty. your bookmarkers are lovely. You did a great job! The colors are beautiful too!